Welcome to Lion Awareness Week - Day 4 - 12 August - International Lion Breeding Awareness Day. Seconds till International Lion Breeding Awareness Day(12 August). Today is solely dedicated to captive bred lion cubs of all ages. How we can improve their survival and improve their animal rights. 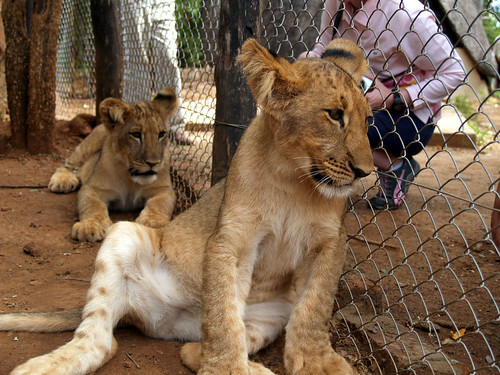 "The owner of a South African lion sanctuary has said that every other facility that breeds cubs in the country is linked to the "canned hunting" industry where big cats are slaughtered by wealthy wildlife trophy hunters." Brits conned into rearing big cats for wealthy wildlife trophy hunters to slay - Link to info 7 AUGUST 2015 mirror.co.uk - "He and others have joined a Facebook campaign called --Volunteers in Africa Beware-- (https://www.facebook.com/volunteersbewarehttps://www.facebook.com/volunteersbeware) which works to highlight the cruel trade to would-be volunteers. "The harsh truth is that when you are cuddling a lion cub or bottle feeding one, you are directly funding the canned lion hunting industry. " Cuddling Cubs - Discover The Darker Side Of Big Cat "Conservation"
"The public should refrain from cub petting, it is important that people are educated to understand that the cub they pet today will be cruelly killed by a canned hunter when it gets older. " Here is another documentry from 50/50 that dates back to December 2012 - the naration is in afrikaans, but luckly english text was added so you can follow.